Hawaii Braces for Twin Hurricanes … New Jersey Criminalizes Sales of Ivory, Rhino Horn … Okinawa Dugongs Bring U.S. Military Airstrip Into Court … Migratory Songbirds Fly to Expanded Reserve in Ecuador … Five Pesticides to Be Assessed for Wildlife Impacts … Inaction on Bundy Stand-Off May Spur More Violence … Wild Horses: Overpopulated or Just Unwanted? HONOLULU, Hawaii, August 6, 2014 (ENS) – Hawaii Governor Neil Abercrombie today signed an emergency proclamation in anticipation of the arrival of two tropical cyclones in Hawaii. Hurricane Iselle is forecast to hit the state Thursday evening through late Friday. Hurricane Julio is a few days behind Iselle and may reach the islands Sunday. According to the National Weather Service, Hurricane Iselle is about 900 miles east southeast of Honolulu with sustained winds of 85 mph, and Hurricane Julio is about 1,650 miles east of Hilo, Hawaii, with sustained winds of 75 mph. Tropical storm conditions are possible on the Big Island of Hawaii on Thursday. These adverse weather conditions may spread to Maui County and Oahu Thursday night or Friday. A tropical storm warning is in effect for Hawaii County, and tropical storm watches are in effect for Maui County and Oahu. Governor Abercrombie’s proclamation, which includes the entire state, activates the Major Disaster Fund set aside by the Legislature for disaster relief. It allows easier access to emergency resources at the state and federal levels, along with the suspension of certain laws as needed for emergency purposes. The disaster emergency relief period for the proclamation begins today and continues through August 15. Recommended preparedness actions may be found on the Hawaii Emergency Management Agency website at scd.hawaii.gov. Residents are encouraged to enroll in local notification systems and monitor local radio and television broadcasts. The Federal Emergency Management Agency, through its National Watch Center in Washington and its Pacific Area Office in Oahu, is monitoring Hurricanes Iselle and Julio in the Pacific Ocean and is in close contact with emergency management partners in Hawaii. When disasters occur, the first responders are local emergency and public works personnel, volunteers, humanitarian organizations and numerous private interest groups who provide emergency assistance required to protect the public’s health and safety and to meet immediate human needs. Although there have been no requests for federal disaster assistance at this time, FEMA has personnel on the ground who are positioned in the Pacific Area Office year round. An Incident Management Assistance Team has been deployed to Hawaii to coordinate with state and local officials, should support be requested, or needed. TRENTON, New Jersey, August 6, 2014 (ENS) – New Jersey Governor Chris Christie, a Republican, Tuesday signed into law bipartisan legislation prohibiting the import, sale or purchase of any ivory or rhinoceros horn product. The measure makes New Jersey the second state to ban ivory and rhino horn trafficking, following New York State, which took similar action in June. The measure makes federal prohibitions applicable to the ivory and rhinoceros horn trade within New Jersey, and includes strict penalties for those caught dealing in the black market for these products. Ivory trafficking is at the highest rate ever recorded, Senator Lesniak said, with more than 41 tons of illegal ivory confiscated worldwide last year. “By signing this bill into law, Governor Christie is closing loopholes in ivory commerce prohibitions that allowed New Jersey to foster the blood ivory trade and poaching profits for terrorist organizations such as Al Qaeda-affiliated, the Lord’s Resistance Army, Janjaweed, and others,” said Assemblyman Raj Mukherji, a Democrat. “Given the role of our ports in wildlife trafficking and the rate at which the ivory trade is driving elephants and other endangered and threatened species toward extinction, these measures will directly contribute to protecting these magnificent species while chopping away at a major funding source for terrorists,” Mukherji said. A first offense will be punishable by fine of $1,000 or double the value of the product, whichever is greater. Further offense would be punishable by a fine of $5,000 or double the product value. Upon conviction, the ivory or horn goes to the Department of Environmental Protection for destruction or donation to an educational institution. The bill would treat the presence of ivory or a rhinoceros horn in a “retail or wholesale outlet commonly used for the buying or selling of similar products” as “presumptive evidence” of possession with intent to sell the product. 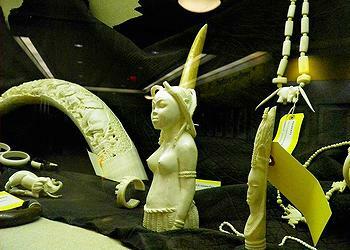 In June, New York State passed a law placing permanent ban on the sale of elephant and mammoth ivory and rhino horn. All five rhino species are at risk of poaching. Africa’s black rhinos are critically endangered, with a population of fewer than 5,000. There are only 3,000 one-horned rhinos remaining in India and Nepal. In Southeast Asia, a few hundred Sumatran rhinos and a few dozen Javan rhinos cling to survival. Their horns, made of keratin, a fingernail-like substance, are used in traditional Chinese medicine, despite conclusive evidence that they have no curative properties. SAN FRANCISCO, California, August 6, 2014 (ENS) – American and Japanese conservation groups have asked a U.S. federal court to halt construction of a U.S. military airstrip in Okinawa, Japan that would pave over some of the last remaining habitat for endangered Okinawa dugongs, marine mammals related to manatees that have long been revered by native Okinawans. The lawsuit, filed July 31 in U.S. District Court in San Francisco, is part of a long-running controversy over the expansion of a U.S. Marine air base at Okinawa’s Henoko Bay. Preliminary construction on the base began earlier this year. Supplementing a suit filed in 2003, the lawsuit seeks to require the U.S. Department of Defense to stop construction on the new airstrip until it conducts an in-depth analysis aimed at avoiding or mitigating harm the expansion will cause to the Okinawa dugong. 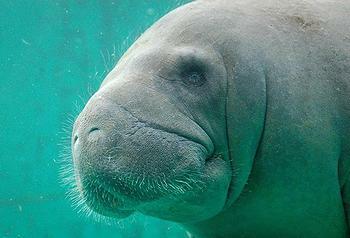 In April, the Defense Department concluded that its activities would not harm the dugong, but the plaintiffs claim that conclusion did not consider all possible effects of the new airstrip, ignored important facts, and excluded the public, including local dugong experts.from its analysis. The dugong is listed as an object of national cultural significance under Japan’s Law for the Protection of Cultural Properties, the equivalent of the U.S. National Historic Protection Act. Under this act and international law, the United States must take into account the effect of its actions and avoid or mitigate any harm to places or things of cultural significance to another country. “Our folktales tell us that gods from Niraikanai [afar] come to our islands riding on the backs of dugongs and the dugongs ensure the abundance of food from the sea,” said Takuma Higashionna, an Okinawan scuba-diving guide who is a plaintiff in the lawsuit. The Japanese Ministry of the Environment has listed dugongs as “critically endangered,” and the animals are also on the U.S. endangered species list. In 1997 it was estimated that there may have been as few as 50 Okinawa dugongs left in the world; more recent surveys have only been able to conclude that at least three dugongs remain in Okinawa. Although the Defense Department acknowledges that this information is “not sufficient,” and despite the precariously low dugong population even under the most conservative estimates, the Defense Department has authorized construction of the new base. The Nature Conservation Society of Japan reports that it found more than 110 locations around the site of the proposed airstrip where dugongs fed on seagrass this spring and summer. For years many locals have protested and opposed the base-expansion plan for Okinawa, where 20 percent of the island is already occupied by U.S. military. The lawsuit was filed by Earthjustice on behalf of the U.S. organizations Center for Biological Diversity and Turtle Island Restoration Network, the Japanese organizations Japan Environmental Lawyers Federation and the Save the Dugong Foundation, and three Japanese individuals. WASHINGTON, DC, August 6, 2014 (ENS) – The Cerulean Warbler, one of the Americas’ fastest-declining migratory birds, now has more protected wintering habitat in Ecuador, after eight years of cooperation among U.S. and international conservation groups. The joint effort by American Bird Conservancy, Fundación Jocotoco, March Conservation Fund, and World Land Trust safeguards rainforest at elevations preferred by many migratory bird species. Ecuador’s Narupa Reserve now totals 1,871 acres, including a new 117-acre parcel within the reserve in addition to a recently acquired 90-acre adjacent property. Situated in the province of Napo at elevations ranging from 3,300 to 5,250 feet, the reserve includes Andean foothill rainforest that provides habitat for both lowland and highland wildlife species. Narupa Reserve, named for an elegant species of palm, is in the buffer zone of the Sumaco Napo-Galeras National Park and Antisana Ecological Reserve, which together protect 833,000 acres ranging from humid foothill forest to high Andean grasslands. “Partnership is essential for lasting conservation success, and I am delighted that World Land Trust has played its part in this concerted effort to extend Narupa Reserve,” said World Land Trust Chief Executive John Burton. 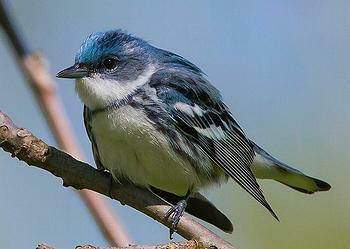 The flagship species for the Narupa Reserve, the Cerulean Warbler, is today among the most threatened migratory land birds wintering in South America. It was formerly one of the most abundant breeding warblers in the Ohio and Mississippi River Valleys. But Cerulean warbler numbers have plummeted by almost 70 percent since 1966. This elusive bird winters in the northern Andes, while it breeds from the Great Lakes region to Georgia, and west to Wisconsin and Louisiana, with concentrations in the Appalachians and Central Hardwoods region. Within the Narupa Reserve, more than 300 bird species have been recorded, including migratory birds that travel between the United States and South America’s humid forests: Canada Warbler, Olive-sided Flycatcher, Western and Eastern Wood-Pewees, Swainson’s Thrush, and Blackburnian Warbler. SAN FRANCISCO, California, August 6, 2014 (ENS) – The Center for Biological Diversity and the U.S. Fish and Wildlife Service have agreed to a legal settlement that requires the federal agency to analyze the impacts of five common pesticides on endangered wildlife across the country. The pesticides up for review – carbaryl, chlorpyrifos, diazinon, malathion and methomyl – have all been found to be toxic to wildlife and may pose a health risk to humans. “We don’t think these chemicals should even be in use, but at the very least, measures to protect endangered wildlife should have been put in place when these chemicals were first approved,” said Collette Adkins Giese, an attorney at the Center. “We hope the analysis required by this agreement will finally reduce the use of toxic pesticides in the habitats of our country’s most vulnerable wildlife,” she said. Under the Federal Insecticide, Fungicide, and Rodenticide Act, the EPA is authorized to approve pesticides for commercial use. But, Adkins Giese says, the agency routinely fails to follow through on a critical part of that process, consulting with the U.S. Fish and Wildlife Service to ensure the pesticides will not jeopardize endangered species. The Center previously sued the EPA for failing to consult over the impacts of these and other pesticides on endangered California red-legged frogs. the nonprofit group obtained an injunction in 2006 imposing restrictions on pesticide use until the consultation was completed. To date those consultations have not been completed. In 2013 the Center again sued, seeking completion of consultation. In the most recent settlement, agreed on July 28, the Fish and Wildlife Service resolved that litigation by agreeing to complete consultation and produce the required formal biological opinions within five years. The agency will consider the pesticides’ impacts not only on red-legged frogs but on all endangered species across the country. The analysis could lead to permanent restrictions on some of the most harmful uses of these pesticides. 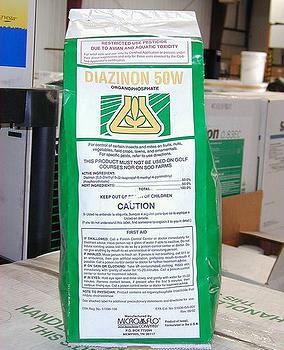 More than a billion pounds of pesticides are used annually in the United States. For most of the 18,000 different pesticides approved for use by the EPA, governmental agencies have not evaluated impacts on wildlife as required by the Endangered Species Act. WASHINGTON, DC, August 6, 2014 (ENS) – The federal government’s failure to effectively address anti-government extremists is making matters more dangerous, according to a new federal law enforcement assessment released Thursday by Public Employees for Environmental Responsibility, PEER. PEER, a national organization representing employees of natural resource agencies, is suing the Bureau of Land Management to force release of information explaining its actions and why the situation was allowed to fester for years, as well as statistics on assaults against its employees. “Like pumping billows onto a smoldering ember, Interior’s retreat in Nevada this spring, abetted by related reckless political rhetoric, appears to be encouraging and empowering dangerous right-wing extremists,” said PEER Southwest Director Daniel Patterson, who formerly worked for the BLM. “This is a form of domestic terrorism which demands a swift, clear and definitive response,” Patterson said. The assessment warned that law enforcement officers will be primary targets of militia attacks since they are perceived “as an extension of state control.” As with the 1996 Oklahoma City bombing of the federal building, government facilities are also at risk. PEER has been pushing for criminal charges against Bundy and militia snipers who targeted law enforcement officers. 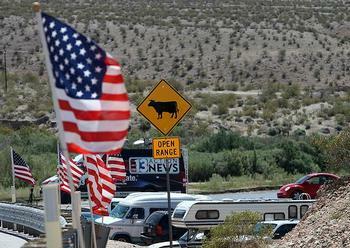 BLM has taken no further action since it backed down this past April from an armed confrontation with militias seeking to prevent seizure of Bundy’s cattle illegally grazing on federal lands. Wild Horses: Overpopulated or Just Unwanted? WASHINGTON, DC, August 6, 2014 (ENS) – The Bureau of Land Management is soliciting bids for new long-term pasture facilities that provide a free-roaming environment for wild horses. The BLM is also soliciting bids for short-term facilities in states that border or are east of the Mississippi River. The solicitations involving long-term facilities are for one or more pasture facilities, each accommodating 100 to 5,000 wild horses. Each pasture facility must be able to provide humane care for a one-year period, with a renewal option under BLM contract for a four-year or nine-year period. The solicitations are open until August 28, 2014. Under the authority of the 1971 Wild Free-Roaming Horses and Burros Act, “the BLM manages and protects wild horses and burros while working to ensure that population levels are in balance with other public rangeland resources and uses,” the agency said in a statement Thursday. The agency plans to remove 2,400 animals from the range in Fiscal Year 2014, down from 4,176 in FY 2013. The BLM is also using population growth-suppression measures. 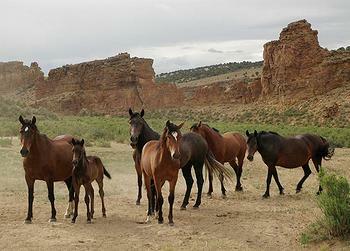 The BLM is implementing recommendations made by a June 2013 report of the National Academy of Sciences to increase the use of population growth-suppression measures on “overpopulated herds roaming Western public rangelands.” The NAS specifically recommended against spaying and neutering wild horses and other fertility control measures that would alter wild horse behaviors. Nevada wildlife ecologist and wild horse expert Dr. Craig Downer is among those critical of the BLM’s management of America’s wild horses and burros. “I am very upset that the BLM wild horse and burro program only continues with its miserable create-a-crisis approach to these wonderful returned native equids,” he told ENS. “This is all cleverly designed to dupe Congress and the public into thinking the wild horses and burros are overpopulated and that they must be rescued,” he said. According to the BLM’s latest official estimate, as of March 1, approximately 49,200 wild horses and burros roam on BLM-managed rangelands in 10 Western states.